In the movie “Field of Dreams” the baseball greats who show up to play ball in an Iowa farmer’s field aren’t exactly real. But when the Georgia Automobile Racing Hall of Fame Association holds its annual picnic on the old Minter family farm in Inman, Ga., the racing greats who come out are as real as can be. On Saturday, some of Georgia’s – and for that matter America’s – real racing heroes, came to meet fans and friends, eat some barbecue, swap racing stories and check out the restored race cars on display. They weren’t the kind of heroes who have PR people to generate publicity. They were salt of the earth folks, who worked long and hard to build the cars they raced. In most cases, they didn’t get wealthy from racing. But to their fans, the enjoyment they provided over the years was priceless. Among the first to arrive was Rex White, perhaps the greatest independent, driver/owner in the history of NASCAR. He won 28 races in the division now known as Sprint Cup and was the circuit’s 1960 champion. Today, at age 79, he’s the oldest living Cup champion, but acts and gets around like a much younger man. Likewise Charlie Mincey, once of the South’s best short track racers, was t here along with an original “skeeter” – a chopped-down coupe with a powerful V-8 under the hood. The black beast carried Mincey’s familiar No. 16. Mincey raced for more than 30 years, but like many of his peers, his career stats have been lost to time. “I won a lot of races, but I never kept up with how many,” he said. Nearby was Ronnie Sanders, the short track ace who spent decades doing battle on asphalt tracks in places like Macon, Ga., Montgomery, Ala., Baton Rouge, La., and elsewhere. Many of his peers, like Bobby Allison and the late Neil Bonnett often said Sanders had what it took to race in Cup, had he chosen that route. Sanders did make three starts in NASCAR’s top division, and amazingly they were all in the Daytona 500. Sanders retired last year, and this season is traveling to races with young Bubba Pollard from Senoia, who with Sanders’ help is dominating the asphalt short tracks of the Southeast. “We’ve had a pretty good month,” Sanders said, and that’s about as close as he ever comes to bragging about his accomplishments, which include hundreds of feature wins as a driver and numerous track titles. Many came to see Jack Jackson, one of the stars of the old Peach Bowl Speedway in downtown Atlanta, a quarter-mile oval that attracted drivers from across the nation. Over the years, the state of Georgia has produced some of the top dirt track racers of all time. Any serious discussion of great dirt racers eventually gets around to Leon Archer of Griffin, Ga.
Archer, who attended the reunion with his son Mickey, honed his skills on tracks around his home, places like Senoia Raceway, Zebulon Speedway, West Atlanta Raceway and Dixie Speedway. When the late Robert Smawley put together one of the first legitimate national touring series for dirt racers, Archer and his maroon and yellow No. 222 Camaros were front runners from the start. It was Archer who won the National Dirt Racing Association’s first championship in 1979. Today, he earns his living driving a truck, but in his racing days he was a full-time campaigner who spent countless hours preparing his cars in an era when many of his competitors waited until late in the week to begin getting ready for the next race. He was the Ray Evernham of his day when it came to car preparation and ingenuity. Archer also had a Kyle Busch-like approach to winning. Nothing else much mattered to him. Once after overcoming a break-down on the way to the track and a flat tire in the race to finish second in the main event at Rome (Ga.) Speedway, he bristled at the suggestion that the night had been a success after all. He also had a habit of leaving a track where he was winning every week in search of stronger competition, with the thought that to be the best, you had to run against the toughest foes you could find. That paid off in spades when Smawley’s circuit cranked up. Another Georgia dirt tracker who earned national recognition was Roscoe Smith, also of Griffin. Smith was an expert car builder and driver. He was building winning cars back in the day when a Late Model car still was built from pieces of automobiles manufactured on the assembly lines in Detroit. And when he took to the track in his black and white cars with the number 44 on the doors and a checkered-flag pattern on the roof, he won his share of races and more. Today his son Clint Smith is carrying on the family tradition, running the World of Outlaws Late Model Series with a car painted much like his father’s once were. 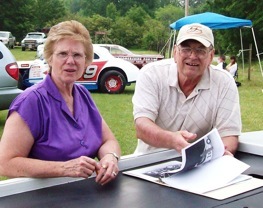 At the reunion, Smith helped Martha Phillips Daniels with her research into racing around her hometown of Zebulon. It was at her home track back in 1967 that one of Smith’s peers and one of the area’s most popular drivers, Arthur Lyle “Fatso” Phillips, lost his life in a crash during a Crazy 8 race. Mrs. Daniels, like many folks from that era, said interest in the track died along with her 26-year-old brother. It closed a year after his fatal crash. Mike Head, a mountain of a man, grew up in the mill village of Cabbagetown near Atlanta, wanting only to drive race cars. His dreams came true and he’s been racing dirt cars for the past 40 years. Sitting under the shade of an old oak tree, Head held court, regaling friends old and new with tales of his years behind the wheel of his orange-and-white No. 54 cars. One story was from a three-quarter-mile dirt track near Gadsden, Ala.
“You’d run so fast there it would sling slobber out the sides of your mouth,” he said. Luther Carter came down from Kennesaw. Throughout his long career racing on both dirt and asphalt, he had all kinds of experiences. One in particular stood out, and he once again shared the details for interested listeners. Years ago, he was leading a race on a north Georgia bullring when a raw rookie wrecked him out of a sure win. The kid felt so bad about the crash, which caused lingering hard feelings between the Carters and the kid’s family, that he abandoned for a time his plans to become a race driver. It wasn’t until a year later that the boy took the wheel again. The second time around, things went smoother for the red-headed fellow from Dawsonville, who went on to dominate races at Dixie Speedway in Woodstock then move on to NASCAR where he became known as Awesome Bill Elliott. A couple of years ago, Elliott sought out Carter and told him how sorry he was about that wreck those many years ago. Carter was deeply moved by the gesture. “It meant a lot of me for a man of his stature to do something like that,” Carter said. Racing memories are precious ones, cherished even more with the thought that as the pioneers get on in age there likely will be some empty seats at the next year’s event. The same is true for many of the old tracks. One of Georgia’s most historic tracks, Lakewood Speedway, the one-mile dirt oval in south Atlanta known in its day as “The Grand Old Lady of Racing” is set to be razed soon. Historian Neil Rucker recently visited the track, which hosted races for the circuit now known as Sprint Cup as well as Indy Car events. He presented Head with a broken section of the concrete grandstand for a souvenir. Head held the chunk of weathered concrete, and the memories came flooding back of the days when he sat on those same old grandstands, possibly on that same piece at some point. “I remember sitting in those grandstands as a little bitty boy, telling myself that one day I was going to drive one of those cars,” he said, before loading his No. 54 and heading off to Dixie Speedway for another night of racing. Racing dreams. Sometimes they really do come true. My Mom & Dad took me to my first race in 1962 at the Peach Bowl Speedway. I have been hooked on racing ever since. I remember coming home from the race and the next morning taking apart whichever model car I had and rebuilding it as a Peach Bowl car. I hope i never forget those memories. I’m glad you enjoyed the story about the GARHOFA picnic. What a great event. I hope everyone who has an appreciation for Georgia racing history makes plans to be there next year. Thank you for a great account of the picnic and all the stories about our racing family in Georgia; I had to be out of town so I missed it this year. Robbie (my husband) enjoyed it immensely. I am always inspired by the talent and achievements of the racing family of the past. I wish today’s racing had the same “heart” as the past; I truly believe we would see more enthusiam and support for the sport. Keep these articles coming, I enjoying reading and learning about the Georgia’s racing community. You have to wonder if some of these folks would have had access to better equipment, sponsors, & just plane better luck, how far they could have gone? I look forward to reading more from you Rick. Good job as always.